I always wear a high waisted pretty underwear, putting the ostomy between it and my bikini undies underneath . It makes me feel better about it all. I don’t like it dangling. And, it hides the circle of the ostomy flange well. I always wear high-waisted pants, form fitting . White pants without pockets doesn’t work usually. Stephanie , I don’t know how you wear low-waisted pants without the top of the bag bulging. I’m really quite comfortable in form fitting clothes. I forget I have the ostomy, unlike constantly having the feeling of needing a restroom before. Hi Stephanie, it’s so good to see you on fb and read your blogs now and then. You are so perfect for being a spokesperson for people with IBD–beautiful, confident, articulate, caring, inspirational. I wouldn’t be surprised if you end up being a real star. Every time I come across anyone with bowel issues, I refer them to your blog. I am very proud of you! Hey Eric, from one guy to another I think I can help. I feel the same way when it comes to my ileo. There’s no way I’m hiking my pants all the way up to cover my stoma and look like Urkel. 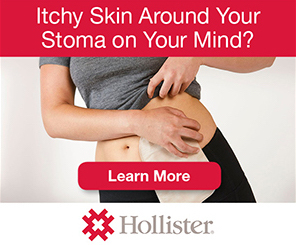 For a while, I would use an ACE bandage to wrap around my stoma and just tuck the rest of the bag into my pants. For this, I didn’t compromise my belt line and wore my shorts/jeans/pants as I normally would. The only downside is it means you have to empty more. While in the hospital, I did some research on a product called the Stealth Belt. You wear your bag sideways (with the opening going towards the right). It makes it so you can wear pants and shorts without having to tuck anything in. It’s got a pouch where you hide your bag with a zipper on the bottom for you to open up and empty the bag. It’s also adjustable via velcro, so you can change how snug the belt is on your body. For example, while working out I tighten the belt up to have support, while resting/sleeping I loosen the belt so I feel relaxed. I don’t think I would know what to do if I didn’t have my stealth belt. Hi , Eric. I’m having the same problem you have. Ostomy is on my belt line. I don’t wear jeans and unfortunately I wear sweat pants like urkel and big shirts. I guess the stealth belt is a good idea but also $100.00 . Been out of work since Sept 1. I had an il o waybup there and the same issues with wearing jeans. So when I learnt I had to go get a permanent colostomy, I did two things: a Laser removed the gear in the affected region, so stopped the hair growing within the wafer fabric and the other thing I did is to get the ost nurse to locate on an area below the waist line where I use my jeans, she looked at the muscles and all that stuff and mover it up one cm from where I had marked it and still worked out good I can wear jeans now Levi’s 501 n 515 which are kind of low waist and am very happy. So if there’s any one out there on their way to get a bag, there you go. I haven’t watched it (because I’m a woman), but I thought it might contain some tips that you could find useful. Or stoma shield by stomagear, excellent revies, and I belive they could custom make for you with proper measurements. I had colorectal cancer and got J pouch (they cut the tumor end reconnected the vowel in a J fashion). but is is not working very well, aand it created a bit of a fistulation process bla bla bla with incontinence problems; doctor offered me that I could have an ostomy and get rid of my problems, and I have been researching about K-pouches, colostomy and so on, could you elaborate a bit on how you K- pouch was? and what took you from J-pouch to K-pouch? This was such an amazing video! I have Crohn’s disease and currently in the hospital. I’m 24 years old and have been doing research. I’ve also been feeling and asking myself….” What am I going to wear! ?” This video really helped me…. I see myself needing surgery in the next few days. Thank you for sharing! Great to know that people have somewhere to go for tips and suggestions. I didn’t have this when I got my Ostomy 15 years ago. I have always used a girdle, or Spanx as it is called now, to secure my Ostomy with skirts or dresses. It keeps it close to my body and when it starts to fill, I can feel it and can address it sooner. I like the idea of the maternity band though. I will have to get one and try it. Thanks for sharing your experiences! Thank you, Leslie. And even just 2 1/2 years ago when I got my ostomy and started this blog, there really wasn’t much out there. It’s been pretty cool to see so many more people sharing their stories. What a great video. Thank you!! Just came across your video, thank you Stephanie!! I’m new to the ostomy situation and was wondering as to how to dress now, how to shower, etc..your posts are terrific. Please keep,then coming! Have so many questions as a beginner, but my mIn one is nutrition and hydration, I think I have the nutrition part figured out, but need help with hydration. I was recommended G2 Gatorade, after drinking it at hospital, I can’t stand it, is there any electrolyte packets I could put in my smart water? My Dr. Told me to try pedialite or drip drop for the hydration. Hope that helps! Hi. I had surgery a month ago. I find it hard to find clothes to wear except leggings, my ostomy is really low but not low enough to pull pants over it. Anyway I wondered do you fold your bag in half when you put the maternity wrap over it? I still can’t figure out how to hide the bag with out wearing long oversized sweaters. Hi, Monic, I do fold the bag a little. I usually pull the wrap down to be about even with the top of my bag, then I fold under the bottom and some of the bag with it. Then, my pant waist is about half-way up the wrap. If the bag is folded, you do have to pay a little more attention and empty a little more often, but it’s never been much of a burden for me. You have no idea how much this has helped me! My home nurse told me wraps cause leaks & I can’t wear my pouch inside my skirts b/c of leaks. It has been such a challenge I don’t even want to go out b/c I can’t hide it. Thank you for posting this. so I stumbled upon this site today, and so far its been helpful. I’ve had my ostmy bag since May, 5 months now, and i tend to use my regular shirts which have been a bit big on me and pants that sit at my waist, so my bag just kinda hangs there. And i never thought of using a band because i thought it would cause it to leak if it filled up. but i guess i should try it and find out. But thanks for giving me the idea. My little sister is 11 and got an ostomy yesterday. I am so glad that I came across this video so that she can see that she can still dress like a normal little girl and not need to feel self conscious or embarrassed. Hey there! I got my colostomy Jan 2016 and yes it is a change but I do feel a lot better. We will be looking at reversal in a few weeks if all test comes back good. Alot of changes to get adjusted to, foods to eat, not to eat but that got easier. Then the issues of what clothes to wear. Yes, leggings it was. Then that got old I wanted to wear my jeans, capris to look normal in clothing again, not oversized anything. To my surprise I ordered some maternity capris and YES work like a champ – so at 48 yrs old would have never thought I would be in maternity clothes again, so never say never just for a different reason. I can’t find any clothes to wear, my iilostomy bludges out . I’m tired of never being able to look nice again. My mother recently had her colon removed and has an ileostomy. She wears pajamas mostly and I was looking for something made for this condition. Why isn’t there gowns or pajamas that just have a snap open and closed area for the ileostomy? Seems that someone would make something like that. 69 yrs old. got my ileostomy when i was 14. still trying to get used to it. just found this site. have a large protruding stoma. been wearing wearing same pouch combo for many yrs. hard for me to try something new. enjoy this site and will continue to read for more info. thanks for postings. Thank you so much for the video. I saw it a few months after I got my ostomy at 70 years old in 2015. The bellaband has made living with an ileostomy 1,000% better. I can forget about it. I wear a bellaband all the time, even when I sleep so the bag is not flopping around. I bend the bag so it fits completely under the bellaband and have never had a leak. The bellaband just expands. Thanks again for making my life better just watching your video. The long-tailed “plumbers” t-shirts and polo shirts from Duluth are nicely sized for wearing over the ostomy with jeans….